Welcome Aboard the Combustible Dust Policy Institute site! In 2012, a preliminary analysis of 2011 NFIRS data indicated 500+ combustible dust related fires and explosions in many sectors throughout the United States with the majority of incidents "near misses." The primary goal of this site concerning the complex subject of combustible dust is to bring forth a situational awareness to global stakeholders, which hopefully will lessen the occurrence and reduce the severity of future accidents. Initially when reading the recent news account of a worker that ignited flammable vapors causing an explosion while using a hand grinder to cut bolts embedded in the floor, it had not donned on me the gravity of the situation. That was until Jeffrey C. Nichols, President, South East Fire Prevention, Inc sent me an email this morning reminding me it could also happen with combustible dust. That is true, combustible dust provides explosive atmospheres just like flammable gases, vapors, liquids, and mists. 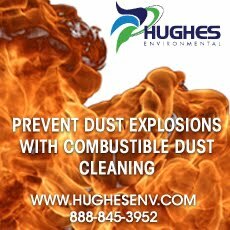 In many instances combustible dust related fires and explosions have occurred due to hot work providing the ignition source. One news account mentions that there was a sign adjacent to work area, that the area was hazardous. The same sort of warning signage should also be in areas where combustible dust is generated. In the EU, the ATEX directives have a provision for such signage. In the USA an OSHA combustible dust rulemaking is in the process and hopefully a provision of warning signage in communicating the risk from combustible dust explosions or fires will be included in the combustible dust rulemaking. It is essential that prior to any hot work being conducted that a job hazard analysis be conducted evalauting the risk from potential fires and explosion. This ensures that a hot work permit includes all the potential ignition and fuel sources in managing the risk. ©Copyright 2008-2012. 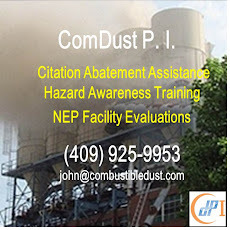 Combustible Dust Policy Institute The information in http://dustexplosions.blogspot.com/ is not meant to be a substitute for the Code of Federal Regulations (CFR), Federal Register, and other OSHA documents, which should serve as the primary source of regulatory guidance. The information on this site should not be used in place of appropriate technical or legal advice related to your company's specific circumstances. 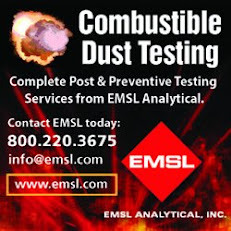 Combustible Dust Policy Institute tries to provide quality information, but we make no claims, promises or guarantees about the accuracy, completeness, or adequacy of the information contained in or linked to this web site and its associated sites. Combustible Dust Policy Institute has no liability arising from or relating to the use, interpretation, or application of the information or its accuracy or inaccuracy. Copyright notice: All materials in this site are copyrighted by the Combustible Dust Policy Institute. No materials may be directly or indirectly published, posted to Internet and intranet distribution channels, broadcast, rewritten for broadcast or publication or redistributed in any medium without permission.